TeleSpeak offers IP PBX solutions from both Digium and Xorcom to give users the ease of use and right level of flexibility to suit their organisational needs, including highly resilient options. These Asterisk based solutions offer an unrivalled range of the soft features of a phone system, such as ACD, complex call queuing and call recording. Importantly, with the ‘complete’ solutions the interfaces are presented in a user-friendly way, rather than an Asterisk or Linux command line synonymous with some early IP PBX implementations. TeleSpeak is flexible and can bring our experience to bear appropriately when you specify your solution, through to installation, configuration and training – or if you prefer, simply supply the right product for your own IT team. The point is we’ll help you to communicate your way. TeleSpeak also offers hosted telephony solutions for those wanting to have the flexibility of deploying and moving SIP devices to locations that suit your changing business needs. Contact us for more details of packages with monthly payment options. Switchvox appliances come in multiple sizes so that you can have a powerful, VoIP phone system to meet the needs of your company today. And, you can easily future-proof your business for tomorrow too. As your business grows, with Switchvox Anywhere, you can seamlessly move to a larger system with minimal associated costs and network changes. 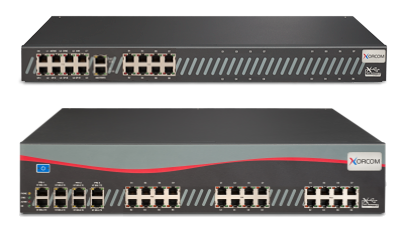 The range of appliances provide support for up to 600 users, and interface cards to connect to the PSTN, or natively to SIP trunks. Switchvox Unified Communication solutions provides the necessary power and connectivity for any SMB. Compare Switchvox appliances and see which one may be right for your business, and contact TeleSpeak for advice and pricing options. Xorcom offers both Complete solutions and appliances that can form the foundation of a customised solution; making the appliances particularly attractive to resellers to add their own value. With a tiered set of hardware that provides the basis of a great value solution from 15 to 1500 users, with no per user licence fees, there is likely to be a Xorcom solution to meet an organisation’s needs. When the most rigorous levels of resilience are required Xorcom offers a full set of options under the brand name TwinStarTM. With the TwinStarTM solution all major parts of the IP PBX solution are replicated, including power supplies, hard disc drives and the server control units. Additionally, if issues arise with any of the components a notification email or recorded message will be sent to the system administrator to enable prompt follow up. It is also worth noting that extended warranties are available at modest cost, helping ensure peace of mind.